We all have our idea of the perfect fishery. But few would consider a concrete bowl as ideal. Being man-made they appear devoid of features and look nothing more than a large-scale put-and-take fishery producing ‘stockies’ for the masses, and only occasionally visited at the start of the season before the more high profile reservoirs open in April. How wrong our stereotypes can be! Waters such as Farmoor, Toft Newton and Walthamstow should be overlooked at your peril. Concrete bowls have unique features that lead to quality fishing. 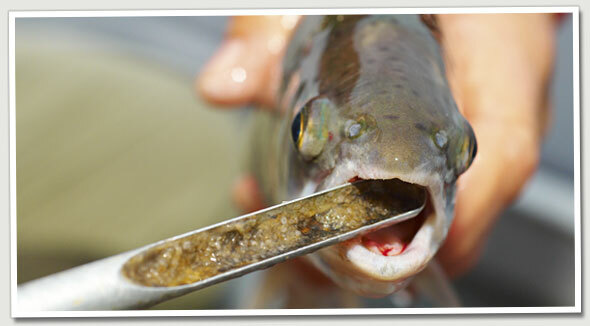 Overwintered fish are plentiful and similar to trout in Rutland, Grafham or Chew. Concrete bowls produce quality fish all year, when anglers on other reservoirs struggle from the bank. For newcomers they are a paradise, well-stocked with deep water right at your feet, allowing fish to be caught close to the bank. Often long casts are only needed in the hot summer months and, once an angler can reach the ledge at around 15 yards, they will have consistent sport all-year. The very shape of a concrete bowl (usually round or oval) means that half of the fishery is always fishable, no matter what direction or strength the wind. The banks are tarmac or concrete allowing easy access to all areas, therefore especially suitable for the elderly or disabled. Casting is easy with few bushes or trees around – just avoid the lip of the wall on your backcast. Vegetation is minimal so your line doesn't tangle. There’s no need for a line tray or waders with deep water at your feet. I’ve found these waters full of daphnia, bloodworm and fry, leading to quality fish. Given the consistent fishing, these waters get a raw deal from many anglers. During early season, a few days prior to fishing, study the weather forecast, especially wind direction and overnight temperature. Avoid fishing after a frost. Cold northerly winds and low temperatures mean fish will be holding at depth, especially early morning when the day is at its coldest. Nothing will be hatching so nymphs will not be an option yet. It's cold so any feeding fish will not chase a brightly-coloured lure pulled at speed. For me, early-season fishing on a concrete bowl is all about doing the simple things right – and staying warm! I always start by fishing directly into the wind, because the wind usually picks up during the day, often making areas unfishable by mid-morning. By starting off into the lighter wind you should get a couple of hours’ fishing over unfished water. I see any fish caught as a bonus and I often catch an overwintered fish or two. Then, when conditions deteriorate, I simply find a more favourable spot. Concrete bowls don’t colour up like conventional reservoirs with wading anglers and muddy banks. Instead, the water is usually cold, clear and deep. I always start on a fast-sinking distance line such as a Rio Outbound Type 8 or a Di-7 with a six foot leader and a single Black and Green Booby. After each cast I wait at least 45 seconds just to give everything a chance to get to the bottom. My retrieve is six-to-eight-inch pulls with a two-second interval between – giving the fly a chance to rise and fall enticingly in the water, yet remain close to the bottom. The next cast I’ll fish the fly with an ultra-slow figure-of-eight retrieve. I prefer to mix up my retrieve rather than fish the same, cast after cast. The fish don’t move much at this time of year so they can soon wise up to the same fly and the same retrieve. When takes dry up my first option is to change colour to a Cat’s Whisker Booby, or a Coral Booby. Then, if no response, I lengthen my leader by three foot to see if they have risen in the water. During early-season, a single fly is more productive when fishing lures in this style. Presentation is better and it gives the angler more time on the fish, as they don’t wise-up to your tactics so quickly. The wind can create a problem, especially if it’s right-to-left, as a bow can form in your line. This bow absorbs any takes making them difficult to spot. I always dip my rod tip an inch under the water in an attempt to keep a tight line and direct contact with my fly – then I simply feel for takes. From 11am to 2pm there is usually a slight rise in temperature, which sees the fish rise in the water. If you just want to catch your limit, lengthen your leader by three foot from six to nine foot and continue as before. However, if conditions are favourable, you may get a short hatch, usually at the top of the wind. Early-season hatches tend to be smaller than in summer and the insects are often black in colour. This brief opportunity can allow you to fish nymphs and target an overwintered fish or two. My preferred method is to fish the bung with an Apps’ Bloodworm on the point and Buzzers on the droppers (point fly 11 foot, droppers eight foot and six foot). Again all flies should be kept in the deeper water. I fish the flies static, with a slow six-to-eight-inch pull every 20 seconds to impart movement into the flies and hopefully induce a take. Your choice of spot is important. It’s cold so the fish won’t come to you – you must find them! If you don’t catch within 30 minutes then move – if fish are in the area you should get interest in the first dozen casts. But you can improve your chances by fishing the features first. Any small change in the bowl’s shape will result in a small point (as at Farmoor and Walthamstow). These points allow food to be channelled across them and will always hold fish. All waters have pontoons for fishing boats, a draw-off tower, pipe work and marker buoys. These areas allow weed growth and hold natural food and fry, so they attract better quality fish. The reservoir bottom will not be a uniform depth. Firstly, there is a ledge usually around 15 yards from the bank – fish always hold here and patrol around the ledge in warmer months. There will also be deeper areas usually by the draw-off tower. Toft Newton and Farmoor have maps in the lodge that give details of the water’s depth around the fishery, giving the angler a rough idea of the drop-offs that will hold fish. Fan cast the water in front of you, present your fly at a variety of different angles, rather than the same angle as many anglers do. It’s these small differences that bring more fish to your net – you also cover more water in the process. At this time of year you should stick to simple tried and tested methods on the concrete bowls. This is not a time to experiment, just keep everything deep and slow. I caught my personal-best reservoir rainbow from a concrete bowl, a fish of 9lb 10oz from Farmoor on the ever-consistent Cat’s Whisker Booby. It was a spectacular fish at the peak of its condition.